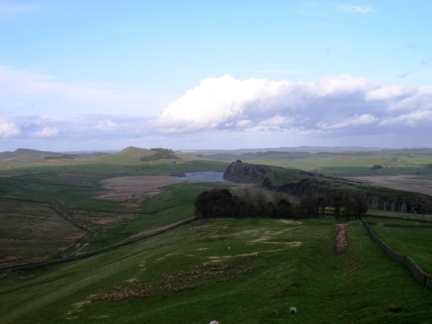 A short walk to the top of Winshield Crag, the highest point on Hadrian's Wall. 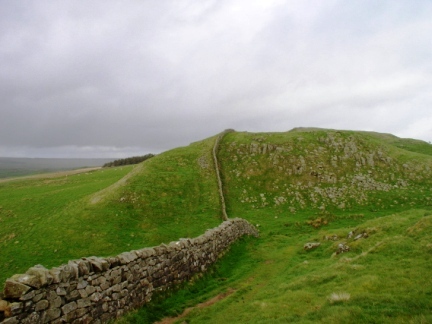 Walk Detail: Our second camping expedition was to Hadrian’s Wall and I’d found what proved to be a very nice campsite quite close to the wall itself. As we’d both taken a half-day we arrived and had the tent pitched by 5pm so I suggested we take a walk on to Winshield Crag before returning via the Twice Brewed Inn for some dinner. 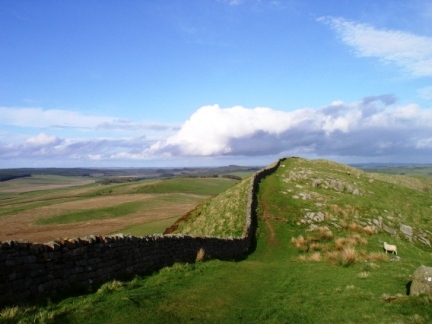 It proved to be a good idea and it was a fantastic first introduction to the wall and the impressive Whin Sill Ridge. 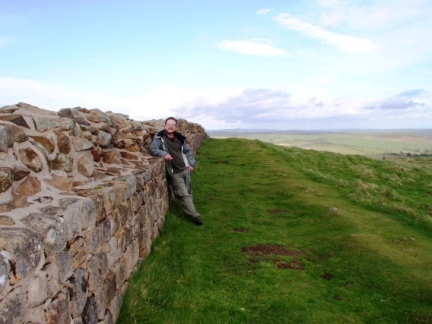 "The summit of Winshield is a commanding viewpoint and beyond the great mass of Wark and Kielder Forests to the north I had my first glimpse of the Cheviots." Almost from the moment that we first started ascending Winshield Crag from Caw Gap there were superb views, not only of Cawfield Crags behind us, but of the lands to the north and south of the wall. The climb to the highest point of 345m was most enjoyable, it was quite a windy evening with lots of cloud interspersed with patches of sunshine. 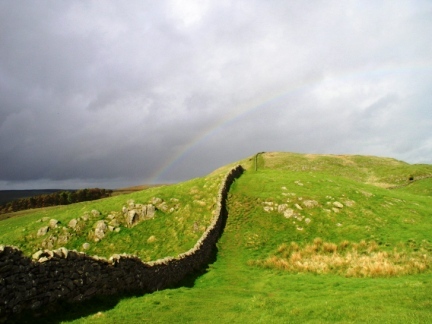 This type of weather merely served to make the views more dramatic and we were even treated to a rainbow crossing the wall. 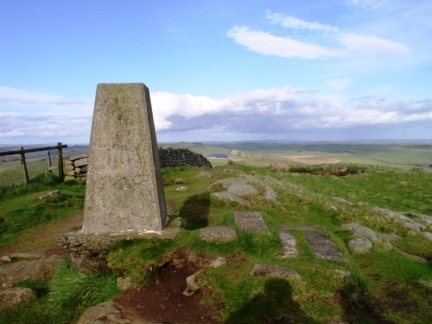 The summit of Winshield is a commanding viewpoint and beyond the great mass of Wark and Kielder Forests to the north I had my first glimpse of the Cheviots. 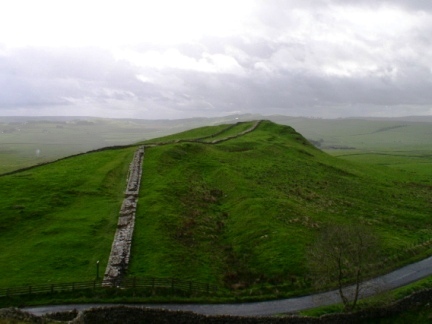 To the south there was a wide sweep of moorland at the head of Allendale and South Tynedale which rises to the heights of the North Pennines of which Cold Fell is the most conspicuous from Hadrian’s Wall. The descent down to Steel Rigg was fairly quick and by the time we both reached the Twice Brewed we were ready for our dinner. I had a fantastic steak pie and a pint, the first time I have actually had one before completing a walk. We both agreed the ‘Twicey’ was rather fantastic and before completing our walk had already made our minds up to return there for our tea the following evening. The return to the campsite via some fields full of cattle and sheep on to a track running along Cranberry Brow was fairly uneventful if a little stressful due to my dislike of walking near anything bovine. Some of the lambs were a joy to behold though and not for the first time this weekend I could not help but smile at a group of them skipping about in play. We made it back to the campsite before dark having had a good meal and a good walk that had served to heighten my anticipation for the rest of the weekend.